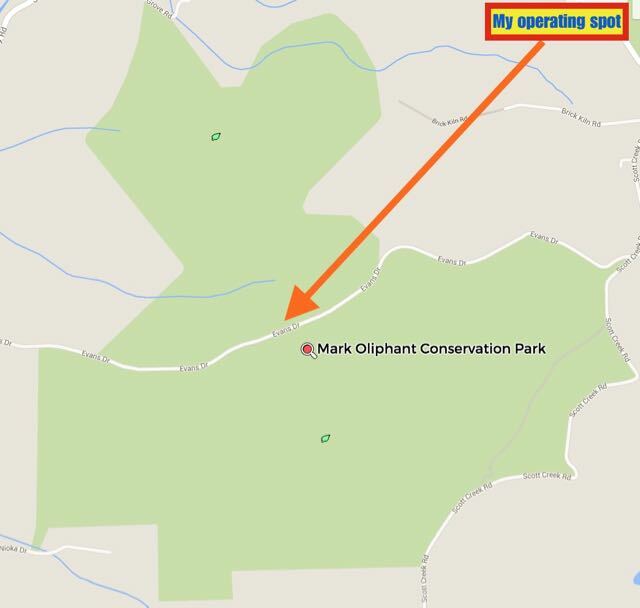 On Saturday afternoon after the AHARS meeting I travelled to the Mark Oliphant Conservation Park, VKFF-782, for another unique activation for the World Wide Flora Fauna (WWFF) program. The park was recently added to the WWFF program. I set up at gate 11 off Evans Drive which runs through the middle of the park. There is a nice cleared area here to string out a dipole. I had spoken with Larry VK5LY on the way to Mark Oliphant. Larry was operating portable with Ivan VK5HS and Peter Vk5FLEX, in the Pike River Conservation Park. Larry had agree to hang around to get a ‘park to park’ contact. So after setting up I quickly tuned to 7.105 and heard Larry calling with a very strong 5/9 signal. I got Larry in the log and this was followed by Peter VK5FLEX. I then headed up to 7.144 and started calling CQ. My first taker there was Alan VK4AL (5/7 both ways), followed by Andrew VK1NAM mobile 3 (5/8 both ways), and then Andrew VK5NPP operating portable from near Mannum in the Riverland region of South Australia (5/9 both ways). Whilst operating I had a local fella walk by on nearby Evans Drive and he waved to me and had obviously heard me on the radio. He shouted out “I am QSYing”. I took a quick break from the radio and had a chat with him and found out that he was not an amateur, but had studied radio back in his cadet days. I think he said with the Army or the Air Force. I went back to chatting on 7.144 and worked a few more VK’s and another local then walked by, with her dogs. Again I stopped for a short time to have a quick chat. She said she was on the way to the shops but would stop off for a look at me operating on her way back. By the time I got back to the radio, a VK2 had moved in on 7.145. So I QSYd down to 7.141 and called CQ and this was answered by David VK5KC. I worked a further 15 stations in VK2, VK3, VK4, VK5 & VK6, before deciding to have a try on 20m. Unfortunately I could not get on to my nominated operating frequency of 14.244 as the band was very busy. So I headed up to 14.310 and started calling CQ. To my surprise, my first taker was Swa, ON5SWA in Belgium followed by Luciano I5FLN and then Max IK1GPG. I later worked out why the Europeans had found me. Allen VK3HRA had spotted me on the DX cluster. And this was followed by two more spots by ON5SWA and I5FLN. Thanks for spotting me gentlemen. It certainly helps enormously to drag in the park hunters. Conditions on 20m were not great. It was quite a struggle at times. But I did manage to get a total of 30 stations in the log on 20m. Countries worked were Belgium, Italy, Spain, Ireland, Germany, Hungary, Switzerland, Slovak Republic, and Slovenia. VK’s worked on 20m were Greg VK8GM with a booming signal, and Daniel VK6LCK. And again I managed a contact with my great mate, Marnix OP7M. I headed back to 40m where I intended to stay for just a short while as it was getting extremely cold. But pleasingly, I had a lot of callers, so I was there for a little longer than planned. First taker upon returning to 40m was Rob VK4FFAB who is a very keen park activator and hunter. This was followed by another eager activator and hunter, Mick Vk3PMG. A few calls later, perrin VK3XPT gave me a shout whilst he was mobile, using his Codan 9350 antenna, minus the whip. Considering that, Perrin had a great 5/7 signal and Perrin gave me a 5/9 signal report. A few calls later, Brian ZL2ASH gave me a call from Wellington. Although not as strong as normal, Brian was still 5/9 and also gave me a 5/9 signal report. A few QSOs later I was very pleased to receive 4 calls in a row from VK6 Foundation operators. They being Simon VK6FSYM, Ahmed VK6FHAM, Chris VK6FDKR, and George VK6FADD. It was a little difficult at times with Simon and Ahmed, as some VK3’s and some USA stations had moved in on 7.140 and were bleeding over onto 7.138. My last contact for the activation was Darren, VK2NNN in Bondi in New South Wales. I then hurriedly packed up, as it was now extremely cold. It was down to just 4 degrees celsius and was almost completely dark. I had a total of 77 contacts in the log. 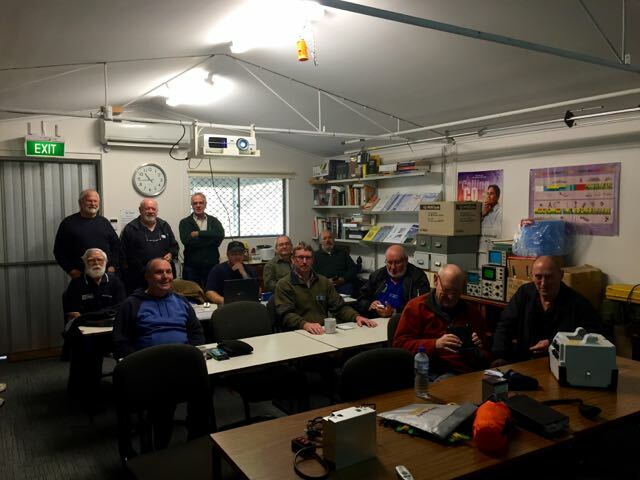 Last Saturday morning I attended the Adelaide Hills Amateur Radio Club (AHARS) ‘shack’ at Blackwood for the regular monthly tech morning. With the help of Chris VK4FR, I delivered a power point presentation with some tips for operating portable. Chris and I also had a display of portable equipment with us including: Yaesu FT-857d, Yaesu FT817nd, Elecraft KX3, various power sources including SLAB, LiFePo, etc, bothy bag, hand held GPS gear, antennas and a variety of other equipment. The session which lasted about 90 minutes, was attended by 12 keen amateurs from AHARS. 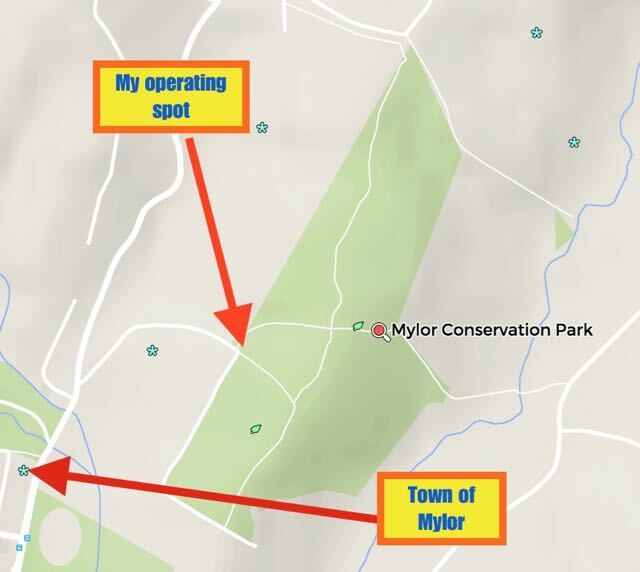 On Friday afternoon (22nd May 2015) I headed over to the Mylor Conservation Park (CP). 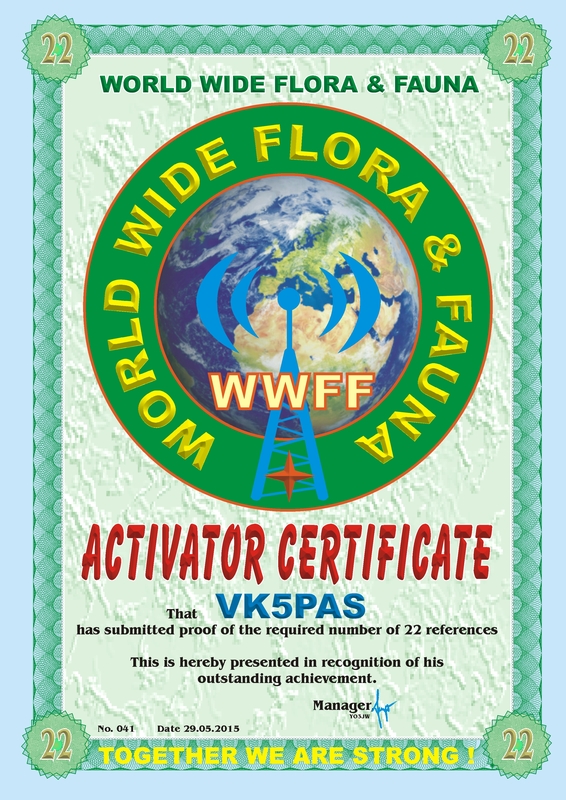 I had activated the park twice before, but this would be my first activation under the World Wide Flora Fauna (WWFF) program. The Mylor CP was recently added to the WWFF program. For information on my previous activations, have a look at….. I set up in my normal spot, just inside the gate off Whitehead Road, which runs off the Strathalbyn Road. The park is very well signposted on the Strathalbyn Road so there are no problems in locating the park. I started off on 40m and called CQ on 7.144. It took a few minutes before some of the regulars found me. 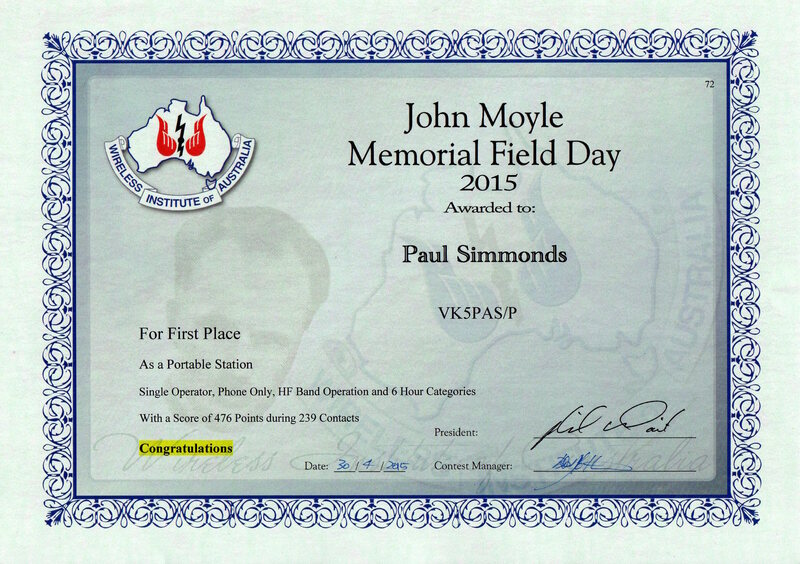 First up was Mick VK3PMG in western Victoria (5/9 both ways), followed by Paul VK3DBP (5/9 both ways), Peter VK3PF (5/9 both ways), and then Amanda VK3FQSO running just 500 milliwatts (5/8 sent and 5/9 received). I worked a total of 16 stations on 40m from VK1, VK2, VK3, and VK5, before QSYing to 20m. I could not get on my nominated operating frequency of 14.244 as there were stations either side from Europe. So I headed up to 14.310 and called CQ. After a few calls, I was called by Baden VK7BRY, followed by John VK2EJP and then Adam VK2YK. My fourth contact on 20m was John VK5BJE. Thanks to Adam VK2YK who spotted me on the DX cluster, as this resulted in the European park hunters finding me. After working John, I was called by a number of European and UK callers. First taker was Danny ON4VT, followed by Axel DL1EBR and then Luciano I5FLN. After working a total of 36 stations, things slowed down. So I took the opportunity of tuning around the band. I found a very rare DXCC working a pile up on 14.225. It was Bruce ZD7VC on St Helena Island. I had worked Bruce before, from home and also whilst out portable, but I was determined to get Bruce in the log from another park. I persevered for about 20 minutes and finally made contact (5/8 sent and 5/6 received). Below is a video of how well Bruce was coming in to Mylor CP…..
After working Bruce I quickly went back to 40m to hopefully get Adrian VK5FANA in the log. Adrian had sent me an SMS message asking me if I was going to go back to 40m. I could not get back onto 7.144 as it was occupied by some other stations, so I called CQ a few times on 7.140 and I was very pleasantly surprised to receive a call from the man himself, Adrian. This was followed by another park stalwart, Rob VK4FFAB. Peter VK2NEO who was mobile then called me, followed by another dedicated park hunter, Doug VK2FMIA. My last caller was Leo VK3FLMR mobile. At 5.30 p.m. (0800 UTC) I packed up my gear and headed home. My son was coming up for tea and to watch the Aussie Rules football with me. This was another successful activation with a total of 58 stations in my log. 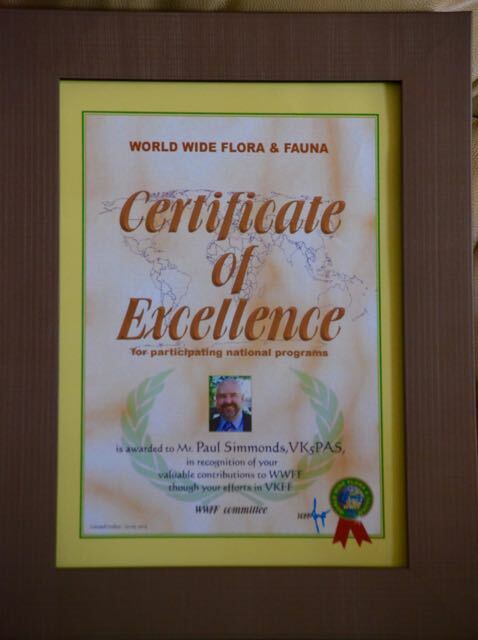 On Thursday night (21st May 2015) I gave a quick presentation on the World Wide Flora Fauna (WWFF) program and the VK5 National and Conservation Parks Award. It was just a quick 30 minute presentation to introduce the group to these 2 great park portable programs. There were about 50 people in attendance including quite a few park activators and hunters, including John VK5BJE, David VK5KC, David VK5LSB, Doc VK5BUG, Greg VK5GJ, Norm VK5GI and David VK5AAH. I took along my Yaesu FT857d, Yaesu FT817nd, a few antennas, a variety of power sources including SLAB battery, LiFePo, and 44 hour power pack, and also some certificates. Photos above courtesy of John VK5EMI. Hopefully it inspired a few more hams to get involved in portable activity. Following the presentation, myself, John VK5BJE, David VK5KC, and Trevor VK5ATQ answered questions from the floor re our attendance at the recent 2015 WIA AGM in Canberra. Last Thursday evening (21st May 2015) I attended the Adelaide Hills Amateur Radio Society (AHARS) general meeting. I was to deliver a presentation that night on the World Wide Flora Fauna (WWFF) program, and the VK5 National and Conservation Parks Award. 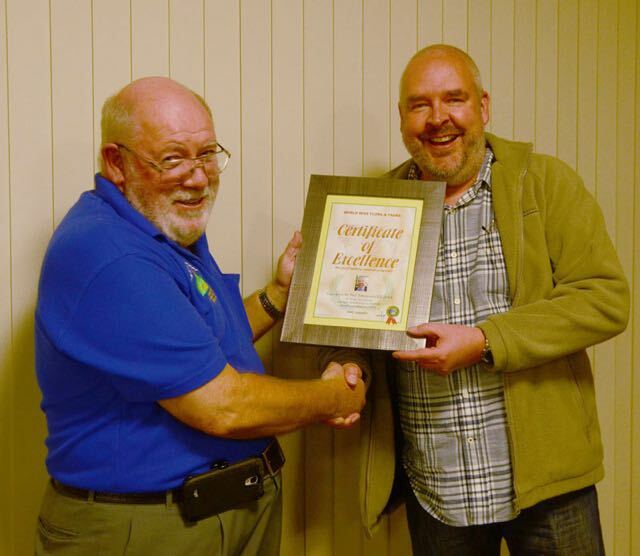 But prior to my presentation I was called up by Barry VK5BW, the AHARS President, who gave me a very nice surprise. 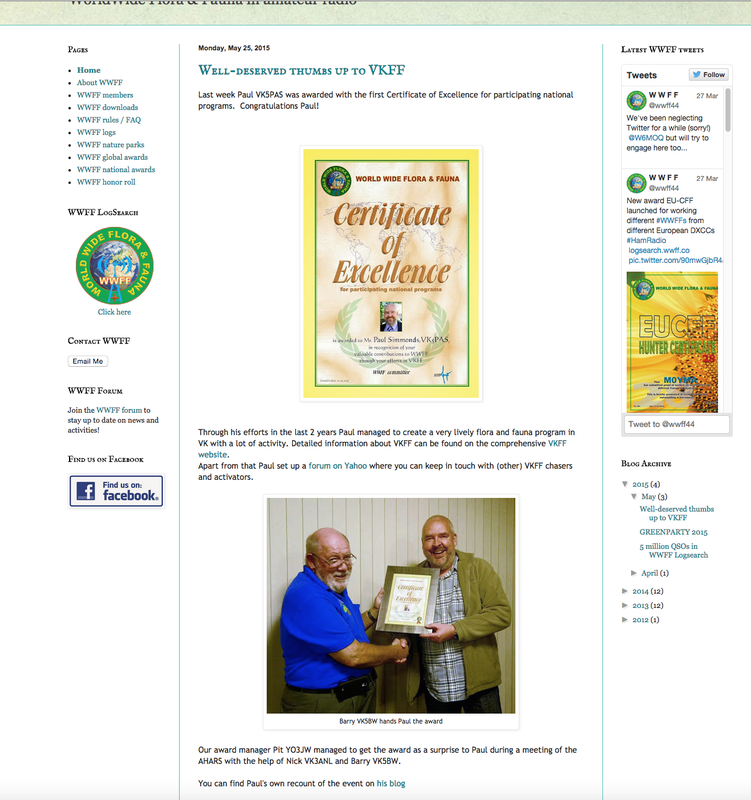 It was a ‘Certificate of Excellence’ from the WWFF Council. Photo courtesy of John VK5EMI. I learnt that the certificate had been sent all the way from Pit YO3JW in Romania, to Nick VK3ANL in Victoria and in turn it had been forwarded on to AHARS here in South Australia. It came as a great surprise. I would like to thank Pit and the rest of the WWFF Committee. It was take great pride in my shack, along with my recent WIA Presidents certificate for my involvement in the WWFF program. 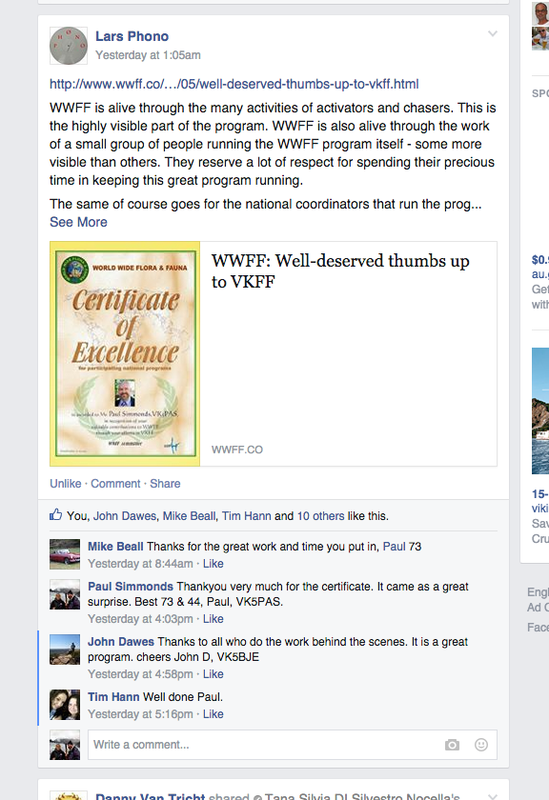 And the WWFF Facebook site…..